Former Chicago Police officer Joseph Walsh, left, former detective David March and former officer Thomas Gaffney. 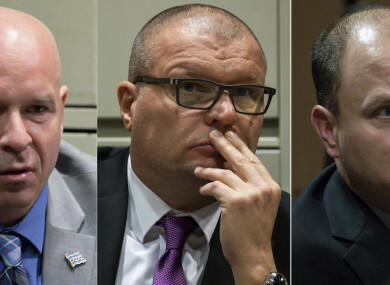 THREE CURRENT AND former Chicago police officers were acquitted Thursday of conspiring to protect a colleague by lying about the circumstances around the fatal police shooting of a black teen. The 2014 killing of 17-year-old Laquan McDonald, which was captured on police video camera, triggered months of protests and became emblematic of longstanding police abuse in America’s third-largest city. A jury in October convicted a white police officer, Jason Van Dyke, of second-degree murder for firing 16 bullets into McDonald. Video of the slaying showed the knife-wielding teen appearing to walk away from officers when he was shot. According to the Chicago Tribune, Judge Domenica Stephenson said the evidence against them was weak and speculative, and she blasted prosecution witnesses as being unreliable. The three charged officers had opted to forgo a jury trial in favour of letting the judge weigh the evidence. “This is not justice,” Hunter told reporters, according to the Tribune. Scattered applause from supporters of the accused trio could be heard in the courtroom after the judge ruled, according to the Tribune. Email “Chicago cops acquitted of alleged coverup in teen shooting”. Feedback on “Chicago cops acquitted of alleged coverup in teen shooting”.